So my prediction for snow was a bit off - we actually ended up getting around 4 inches and it snowed nearly all day! The snow was gorgeous and it melted fairly quickly on Monday, but there is a still a thick blanket coating my shade-ridden yard. You would think that my dog, who hates water and getting her paws wet (seriously, she's something else), would hate snow. Nope, she goes crazy for it! We went outside with her Sunday night as it was coming down thick and she proceed to run around the yard at lightning speed and buried her face in the snow. Clearly, she is a special, special pup. While my dog was craving some serious snow time, I was craving lettuce cups. I love lettuce cups and every time I order them I say that I need to recreate them at home because they are such an easy, healthy meal. Fast forward a good decade and I still hadn't made them! I had a serious craving on Sunday so I decided that a snow day would be the perfect time to do some lettuce cup recipe testing. Since I definitely wasn't venturing out in the snow, I improvised and used what I had on hand. Chicken? Nope, I've got half a block of tofu instead. Lettuce? Just spinach, but I've got a gorgeous head of green cabbage. After all the chopping, sauteing, and peeling - I think I may love my vegan, g-free friendly version even more than the original! The cabbage lends a great crunch that you don't find in lettuce and the tofu makes this meal light but filling. The marinade and sauce couldn't be easier and it takes mere minutes to cook. The snow has melted now and it's supposed to be 70 degrees tomorrow but luckily, this recipe works for both spring and winter weather. It's also a great post Mardi Gras meal if you're feeling a bit, um, lackluster today...just saying. 1. 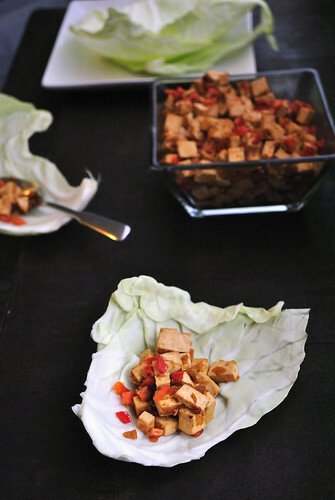 Cut the tofu into very small cubes. It may seem tedious, but just think of it as an opprotunity to work on your knife skills. I did about 1/4 inch cubes but I'm sure my husband could have busted out a mean brunoise that would have been ever better. Set ingredients aside. 2. Grate ginger and garlic over a large bowl or tupperware container. Add tamari, oil, and sriracha. Whisk to combine. Add tofu to container - I like to use a rectangular glass storage container with a lid so that I can shake everything up and ensure that it is coated - if you're just using a bowl, give everything a gentle toss to ensure the sauce coats the tofu. and let marinate in the fridge for about 30 minutes. Longer would be fine as well. 3. 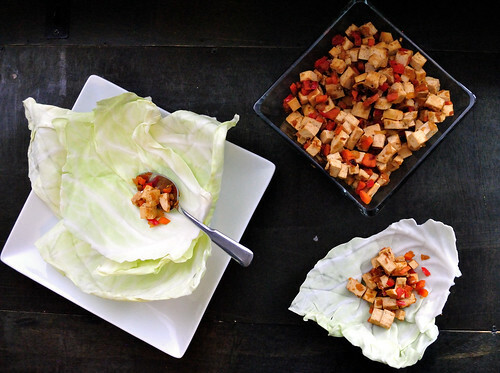 While the tofu is marinating, separate your cabbage or lettuce leaves and prep the rest of your ingredients. Remember, smaller is better! 4. Heat a large non-stick skillet over high heat. You want the pan to be super hot. 5. Once the pan is hot, add a few drops of sesame oil or canola oil (not olive oil - the smoke point is too low) and give it a swirl. Then carefully add onions. Saute for a few seconds until they begin to turn translucent. Add carrots and bell peppers and saute for another 30 seconds until they just begin to soften. 6. Add tofu, with marinade, and saute until most of the sauce has become very thick and is mostly absorbed. Shut off heat. 7. 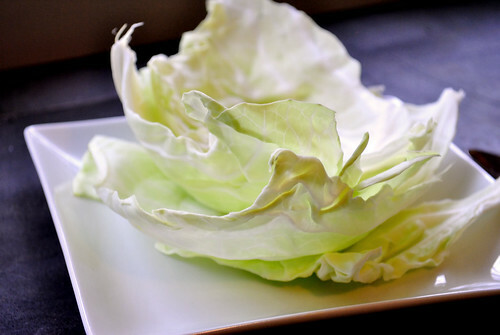 Serve with cabbage or lettuce leaves.